“Now that you´re about to turn 30 you should take better care of your heart, lungs and breasts”. Those were the words my doctor declared to me in one beautiful morning of January a few years ago, when I visited him for a regular check up. “You should make important changes to your eating habits and attend regular medical checks ups in order to be aware of any negative changes, since these are the most vulnerable areas for women and a prominent cause of death these days”, he continued to explain calmly. I look straight into his eyes but my mind is running in circles thinking about that word. Death. “Yes. Thank you. See you later”. It was the only thing I could replay because all I wanted was to be alone and think about it. On my way home, I couldn´t stop thinking about my doctor´s advice and once I got home I ran to my computer just to ask Mr. Google about women´s health. We´ve learned from the media how devastating breast cancer can be, however I was in shock to realize that according to the Center for Disease Control and Prevention CDC 38% of female deaths in the United States are caused by heart disease and cancer (especially lung and breast cancer). I remained sat in my couch trying to internalize all the information. A few hours later, I called my doctor to thank him again, because that was something I haven´t thought about before and he opened my eyes to be aware of these specific threats. “The first step to staying healthy is knowing what you’re up against, and then taking the necessary precautions to reduce your risk”, he advised me in his characteristic calm voice, and those words are still on my mind. Having that health awareness when I was becoming more vulnerable due to my age has been a precious gift to me. When I think about that and relate it to my own experience helping moms like you in the areas of finances over the years, I’ve realized that just like when we strive to prevent a heart disease and cancer, being aware of the symptoms can help us prevent any form of domestic violence, such as physical, emotional and financial abuse. Planning in every area of your life will help you not only to set your goals, vision, mission, strategy and milestones, but to be more intentional, enjoy and grow by recognizing your achievements and failures, and for being aware of your risks. For a mom who lives with her partner, one of the major risks you are up to is domestic financial abuse since it happen in 98% of any abusive relationship in USA, but sadly this matter is not acknowledged much. The majority of the victims are women, so you are more likely to get in the trap if you can´t recognize this form of abuse. If you are not married but dating someone, it is also important for you to know what signs to be aware of in order to reduce your risk. Sometimes the signs of an abusive partner can be shown during the dating period, but we tend to look at them as random meaningless acts. Knowing them in advanced will help you to recognize them and be able to leave before you move forward in the relationship. Being aware of domestic financial abuse will help you to plan ahead and be as cautious as you can to reduce your risks, avoiding to feel weak, devastated, worthless, useless and horrible just because you didn´t realize it before. This is a 25 actions checklist you should pay attention to (adapted in part from the National Network to End Domestic Violence´s (NNEDV) Moving Ahead Curriculum), since they are warning signs of financial abuse in a relationship. 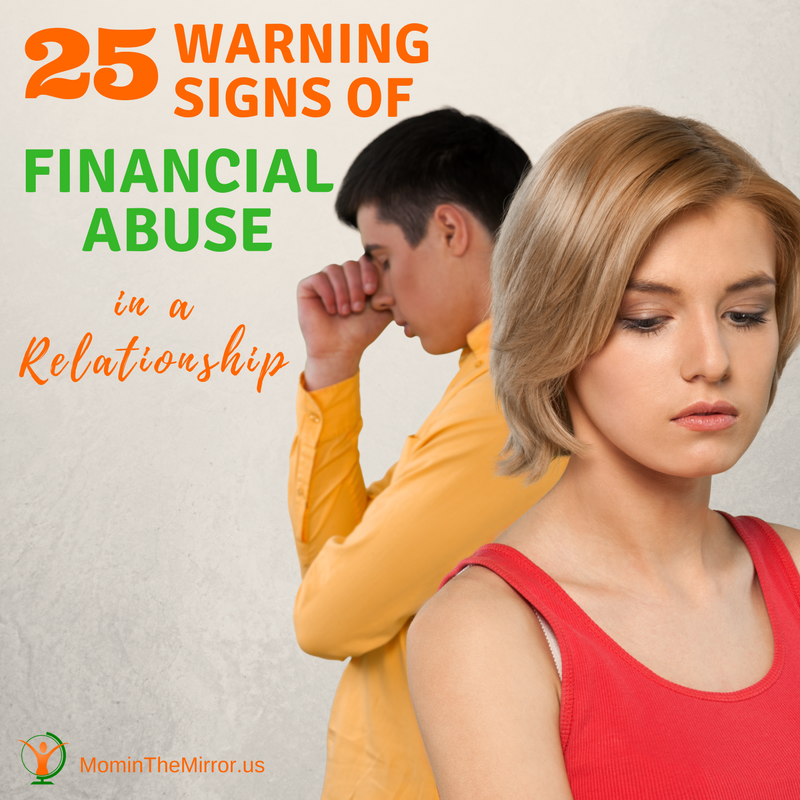 If you checked one, a few, many or all of these 25 actions you´re very likely to be experiencing domestic financial abuse in your relationship. Maybe you had seen one act of disrespect one day and let it go because you justified it, later another act will appear and as time goes by you´ll realize that the seeming random acts are not that random but part of a trap. There is hope. You are not alone, you can find help. If you answered no to all of them, you are not involved in a financially abusive relationship, so I encourage you to keep handy a version of this checklist in case something different arises. Do you think you´ll recognize any of them in a mom friend or family who is being financially abused? Share in the comments which of these 25 actions checklist you think is more devastating for a mom.